Phantoms netminder Jordan Marr makes a save. Photo: �2018 Tom Scott. All rights reserved. 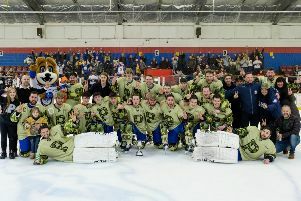 Peterborough Phantoms sealed a second successive runners-up finish when ending the regular NIHL Division One South season on a winning note last night (March 17). The city team beat Streatham 6-2 to clinch second spot and earn a date against seventh-placed Milton Keynes Thunder in the opening round of the play-offs this weekend. Slava Koulikov keeps a close eye on proceedings as Phantoms beat Streatham. Photo: �2018 Tom Scott. All rights reserved. Double cup-winners Phantoms finished the campaign five points behind big-spending champions Swindon - another case of huge over-achievement in the eyes of head coach Slava Koulikov. He said: “If the league table was based on budget we would be sitting in fifth or sixth position so to have already won two cups and challenged so hard for the title means my guys have done a great job. “I’m sure that if I had the budget that Swindon have I would also have made the right decisions around Christmas time and we would have won the league. “But it has been an amazing achievement to finish so high in the league and win two cups - and we still have more trophies to chase. The Phantoms concluded their league season with the traditional lap of honour with the fans. Photo: �2018 Tom Scott. All rights reserved. Phantoms have found themselves playing catch-up in several recent games, but an explosive start ensured that wasn’t the case last night against Streatham. 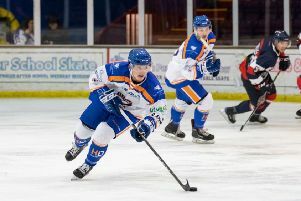 In-form import Ales Padelek pounced to put them ahead inside the opening minute before fellow forward Corey McEwen and defenceman Scott Robson also contributed to an early three-goal cushion. Phantoms were actually out-shot by their sixth-placed visitors in that opening session and it was a similar story in the second period as the game became increasingly fractious. Alex Roberts pulled a goal back for the South London side before Nathan Pollard provided a fine finish to a slick fourth goal for Phantoms. The bad habit of conceding when on a powerplay reared it’s ugly head again for Phantoms in the first minute of the final period as Streatham man Adam Carr struck, but Petr Stepanek then lit the lamp at the right end seconds later during the same numerical disadvantage. Captain James Ferrara completed the scoring for Phantoms as they finished the regular season on a high. Koulikov added: “We have been behind in too many games lately and also conceded too many goals, so it was good to see us correct a couple of the things we addressed before the game. “We’ve won every game against Streatham which is an excellent achievement considering they have beaten all of the other top sides. Phantoms are expected to travel to Milton Keynes this Saturday (March 23) and then host the Thunder in the second leg the following night (March 24).